Once upon a time, young designer Amit Shimoni was contemplating the state of Israeli cultural icons. He Googled a photo of Theodor Herzl, 19th century founder of the World Zionist Organization, and was surprised to see only two accurate photographs of the known figure. He compared his findings with a search of an "average 18-year-old guy," which yielded endless results. Shimoni took it upon himself to correct the imbalance by starting a series of illustrations that depicted the founding fathers of his home country, rendered in the bright colors you'd find on a friend's Instagram feed. The series was successful, eventually inspiring the artist to expand the work into "HIPSTORY," a broader project that turns the great leaders of modern history into, well, hipsters. Think Queen Elizabeth donning Coachella-ready head-ware, Angela Merkel with a trendy bull ring and matching gages, and Martin Luther King in chic camo and a "Dream Big" hat. "The history of the last century is heavily defined by its prominent figures," Shimoni explained in an email to HuffPost, "the main leaders who shaped the course of history. I often find myself imagining a world where some of these leaders are less interested in influencing lives, and more focused on their own persona." 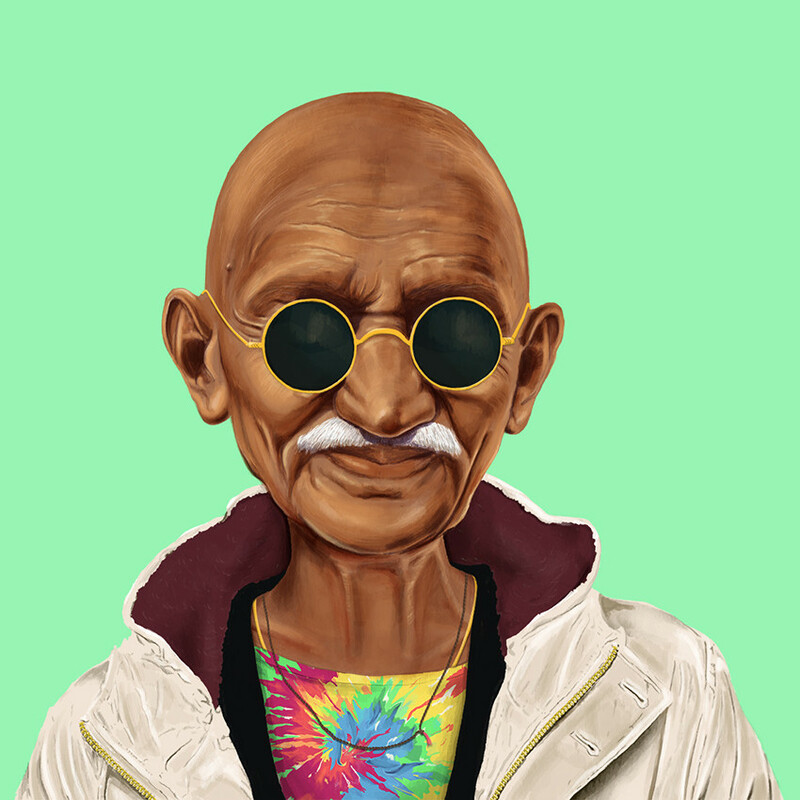 He encourages his fans to imagine Gandhi obsessing over his looks, rather than protesting British rule of India, or Abraham Lincoln searching for the perfect dive bar, instead of working toward the abolition of slavery. "HIPSTORY" does this for them, in fact, placing recognizable icons in different times and cultures, ones defined by contemporary sets of anxieties and concerns. He's quick to mention that the project isn't meant to criticize one generation over another, but serves to highlight the differences. "It is my hope that this series will encourage us to reflect: upon our leaders, our society, and ourselves," he adds. "And failing that, HIPSTORY will at least make us smile." Shimoni tells us that he has plans of continuing his hipsterizing art, hoping to add one American political figure very soon -- Hillary Clinton. We can hardly wait. For more of Shimoni's illustrations, check out his work here and here.